Horn:The Horn Pipes are designed with the Renaissance person in mind. The styling of these pipes will fit any situation, any place, anytime. The style and elegance transforms and sets a mood of timelessness. This pipe fits the person who is equally comfortable in a palace or cottage. Own one of these pipes and sense a connection with the past and the future. Every Horn is beautifully finished, bringing forth the incredible and unique wood grain that is captured within each pipe. Combining style and comfort, the Horn is a pipe to be admired and enjoyed for years. Hunter: The Hunter Pipes are distinguished and personalized by a wild stag antler crown joined to compliment the shank and receive the stem. Each is a handcrafted beauty of the warmest grain wood. Ready for fireside, in field or den. Hunter Pipes are primarily made in the STAR (Select) and CRESCENT (Superior) Grades, with an occasional SUN (Premium) Grade as dictated by the quality of the wood. Hunters may also have various custom treatments to the shank to compliment the antler crown, and may also have burl topped bowls. Hunter Pipes are also made in Freestyle Designs. Every Hunter Pipe, regardless of whether it is a Standard Shape or a Freestyle Design, is a true one-of-a-kind creation. Trever Talbert writes, "When we moved to France I had to sell off a sizable chunk of my pipe collection to help finance the trip, and sadly this was one that I let go (The majority of the pipes I kept had sentimental value instead of monetary, which meant that many of my best high grades departed via ebay to raise trip cash). This is a pipe by US pipemaker Sam Learned. One doesn't see a lot of talk or hype about Sam's pipes online, but he does nice work and is a really extremely good fellow. He has developed a consistent and distinctly "American Rustic" look with his "Hunter" shapes like this one of mine." This article was originally published in the September 1997 issue of The Pipe Collector, the official newsletter of the North American Pipe Collectors Society (NASPC), and is used here by permission. It's a great organization--consider joining. I was born in Seattle, Washington on September 17, 1936. My father was a hard working, self made business man. At 14, he signed on as an engine wiper on the President Jackson out of Seattle bound for the Orient, and from that day forward, for the remainder of his 78 years, he never stopped. He traveled and worked all over the world. I travel a lot myself, but it will take me another lifetime to get to all the places he went. My father was not a pipe smoker, but my grandfather was, so perhaps my fondness for and fascination with pipes skipped forward a generation from him. My mother was of Swedish stock from Nova Scotia, and I like to thing I got my brains from my father, and my good looks from my mother. In 1946, our family moved to Phoenix (I have two younger brothers, both still living in Phoenix). On June 4, 1960 I graduated from New Mexico State University with a Bachelor of Science in Chemical Engineering, and on June 10 I was on active duty as a shiny new Second Lieutenant at Fort Benning, Georgia. I was an infantry platoon leader with the Second Battle Group of the Second Infantry Brigade and finished my military career in 1964 as a First Lieutenant and an instructor to the staff and faculty of the Chemical Corps School at Fort McClellan, Alabama. After the service, I moved to York, Pennsylvania, where I still live, and worked with my father for a few years as an engineer in one of his businesses. That business was sold, and I went to work as a corporate engineer with a local company. During this time, I was the patentee on several machine inventions for the company, and I developed an inters in patent law. I approached the patent attorney, who had worked on my inventions and asked if he had anyone in mind to take over his practice when he began to think about retirement. He said that he did not but that it was pretty good idea, and why had I asked? "Well,"" I replied, "how about me?". He indicated that first I would have to get into law school, then graduate from it, then pass the state bar, and then pass the federal patent bar. "OK," I said, and three years later, in 1973, I received my Juris Doctorate from the University of Baltimore and began an associate practice with him. I started smoking a pipe in the Army when a friend and fellow instructor, Lt. Peter Paolucci of the Bronx, introduced me to pipes and really good Italian food. My pipe collection consists of rather pedestrian pieces picked up along the way in addition to pipes I have made myself and a growing list of those by Savinelli, Jørgen Larsen and Peter Stokkebye. I am not a Dunhill person, but I met and much enjoyed my visit with Bill Taylor at the Charlotte show in the Spring of 1997, and an Ashton or two are on my watch list. I have yet to obtain my first Jess Chonowitsch or Sixten Ivarsson, but they will come, and someday I hope to meet these gentleman as well. For several years, I had seen, admired and purchased the pipes of Jim Margroum (Mr. Groum) at the South Mountain Fair, a festival held to commemorate the Adams County, PA apple harvest. Jim, a quiet and rather private gentleman, is a self-taught pipe maker who signs his pipes "Mr. Groum." Jim is retired now, but he continues to make about 200 pipes a year, as he has for the past 30 years or so. Jim specializes in fanciful carved pipes, the most famous of which is his "Apple Pipe," which is carved in the shape of an apple. My father was not a wood worker, nor was I, except for some whittling as a boy and a brief period in my teens when I carved a set of Mallard duck decoys from Western Cedar. So my hitherto undiscovered desire to carve pipes and my subsequent skill at and pleasure in doing so have come as much of a surprise to me as they have to those who know me and who discover what I am doing. In any case, in December, 1995, I approached Jim Margroum (who has since become a very good friend) and asked if he would take me on as an apprentice. I put the request to Jim as straight as I could, we seemed to hit it off, and he agreed to take me on. Jim later told me that he had wondered if I would hang in there, but when he saw that I meant business, and when my skill did develop and improve with time, he had no doubt about his initial decision to train me. My apprenticeship with Jim consisted of two 4-hour afternoon sessions each week for one year, working in Jim's shop and under his guidance. At my first session, on Jan 4, 1996, Jim gave me an hour's orientation on the equipment and how to use it to make a pipe, handed me a block of briar, and ordered me to "Make a pipe". After that, Jim would start each session with a brief lecture on how to select and best use a piece of wood, pipe styles, working techniques, and how to deal with the inevitable defects that show up in briar. Then I would make a pipe. Sometimes he would give me a block and dictate the pipe he wanted me to make. At other times, he would give me a block and tell me to get two pipes from it. Jim gave me just enough direction and guidance so that I had to work to figure it out, and with that approach, I started to quickly develop my own technique and style. When I really got stuck, Jim would show me--and of course make it look easy. I also assembled and read everything I could get on pipes and what little there is on pipe making. I started attending pipe shows and receiving comments and critiques on my evolving work, and I started bringing some of my own new ideas to Jim. Also, I began setting up my own shop so that I could spend time working on my own as well as continuing my sessions with Jim. Jim taught me the basics of the technical, design and style considerations of pipe making with Grecian plateaux briar as well as the fineness and frustration of working the wood. After Jim, one of the first pipe designers I got to spend some time with was Ed Burak on a Saturday afternoon in New York. Ed is a self-acknowledged highly opinionated individual, one of many pipe collectors and smokers have difficulty relating to. Curiously, however, after an exchange of tolerably equivalent indignities, Ed and I moved to the higher plane of cordially discussing and critiquing my work. This is a man who has work in the Museum of Modern Art and also charges from $1,800 to $7,500 for his Design pipes. He was very complimentary of my technical skill and indicated that , in three months, I had accomplished in terms of technical competence what had taken him five years. However, Ed was left flat by my lack of design creativity. He also did not like the fact that I stained my pipes and virtually commanded me to finish all pipes in the natural wood color, with only buffing and polishing with carnauba wax. Ed was helpful in directing me to sources for higher grade briar than I was able to get at that time. Regarding defects in the briar, he admonished me not to worry about them but to raise the design quality of my work to a high technical level and to let the defects take care of themselves. To which I replied, "That's easy for you to say." Nevertheless, Ed Burak did have a marked creative motivating influence on me. Following the Burak encounter, I attended the 1996 Dallas pipe show, where I met Dr. George Amrom, a Philadelphia collector. Medical Doctors and lawyers have difficulty even being cordial to each other, but George and I overcame that, and, after seeing my first attempt, he introduced me to Rick Newcomb, who is a friend of both Chonowitsch and Ivarsson. Newcomb was nice, but it was clear that I was out of my league. So back to the drawing board and sanding bench for me. My next public appearance was some six months later at the 1996 C.O.R.P.S. show, where I ran into George Amrom again. This time I had a briefcase full of my rendition of both Danish and Italian style horns--I had studied both Chonowitsch and Savinelli well. My pipes were executed with a high level of technical skill, and the pieces came from reasonably defect-free burls of light-weight wood. I had mastered well the reading of grain to obtain the maximum effect, with a beautiful birds-eye pattern on the top of the shanks and up the inside face of the bowls and up the back of the shanks and back of the bowls, with equally beautiful radiating flame patterns along the opposing outer sides of the shanks and bowls. So they were familiar, but were also clearly set apart by my own sense of design. George was impressed, but he had two problems with actually buying a pipe, although he came close. First he did not like my staining (shades of Burak), and second, I was, in his words, "a no-name pipe maker" (you need a thick skin as a pipe maker and must always remember that the critiques you get are from your own good). Always on my toes, I told George that he had better get a pipe before I became a "Name" and the prices jumped substantially. He was unimpressed. I also rub elbows occasionally with Pennsylvania pipe makers J.M. Boswell and Mark Tinsky [Mark is now located in Montana--Pipedia Ed]. Both have helped and supported me, for which I am very appreciative. From all this high-intensity exposure to and immersion in the craft and from contact with those who practice and appreciate the creativity that comes out of it, I have now begun to accomplish what Ed Burak suggested: my styles and my name are becoming known, and more and more of my pipes are naturally finished. I also offer a selection of smaller pipes in various free-style shapes. I grade my pipes in each line according to the quality of the wood and set the price accordingly. A premium graded piece of briar does not always enable the making of a premium pipe, for even "premium" wood can be and often is full of unmanageable defects and yields nothing but a piece of scrape. When a defect in a critical place appears while finishing the pipe.... well, that can be heartbreaking even for a lawyer. I have come to learn and to respect the fact that a well-executed briar pipe in any style or tradition is truly a tribute to the artisan, whether that be me or someone else, and that is the standard I strive for in my work. My pipes are being carried in a local art shop and have sold well there. Otherwise, I sell them myself at shows and to people who have met me or seen my work or who are referred to me. I do not rule out selling my pipes though a smoke shop or two, but I have not yet gone that route and have no present plans to do so. My shop is modest but certainly adequate for making a few hundred high-quality custom pipes a year. I have a band saw, lathe, drill press, tenon cutter, and sanding and buffing wheels. Most of my hand work comes in at the finishing stages of making a pipe--getting the final flow of curves and finish and shaping and finishing the stem. I do some fanciful pieces, my favorite being the Large Mouth Bass, most of which is hand work and takes a lot of time. I've met a pipe maker or two who boast that they never do any hand work on a pipe, but I can't make that claim. 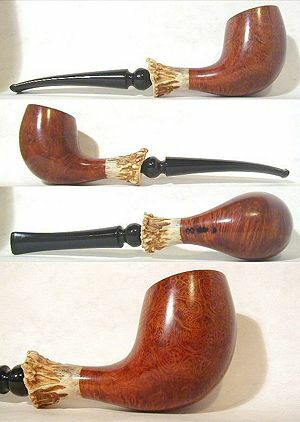 Much of what I want in the qulaity and style of my pipes can only be achieved, at least by me, though hand work. So far, I have made about 350 pipes, and my current output is about five per week or 20 per month. My goal is not necessarily to make more pipes but to make continually better pipes. I would like to produce 200-250 very high-quality collector-class pipes in horns and free styles per year, with time left over for creating new designs and styles with conservative taste in the classic traditions--with a few "wild" things here and there along the way. A new direction in pipe style for me is bamboo stem pipes. Building my first prototype is on my schedule, but it will be a while before I develop the production techniques and the styles that are suitable for me. I have a real fascination with making horns., They have style combined with classic grace and beauty, and they are not just for looking at but for smoking as well. I spend a lot of time on each pipe getting the lines to my satisfaction, and I may well set an almost-finished pipe aside for a week or so and then come back to it with a fresh perspective, make a few marks on it and finish it. Also, the largest and highest grade pieces of wood are reserved for horns, and with luck I may get two pipes from one piece of wood--a horn and a free style or a hunter's pipe. Then again, I may get none. If I didn't exercise some discipline, I would probably make nothing but horns, which is not to say that I don't enjoy making other styles, but horns are my favorite. Next is a tossup between free styles and hunter's pipes, both of which have their own challenges. Frequently, that which I learn in making one style of pipe directly translates to increased creativity and skill level in making another style, so I do recognize that to become stagnated in once style would slow my continued progress overall, even though I might become really great in the one style I'm stuck in. With the pipes I am making and with the quality and skill level I try to invest in each one, it takes me a day to turn one out, regardless of style. The bass pipes take longer, but they are sort of a "hoot" in any case. My early days of learning to carve continue as I seek to push my skill and style levels higher. Often what was so challenging to accomplish earlier I can now perform as a matter of course. Drilling an air hole to dead center bottom of the bowl line, fitting the tenon to the tenon hole to abut the air hole so that fresh pipe cleaner can be smoothly run all the way through the stem and shank to enter and curve up the bowl, and maintaining the bowl shape and the flowing curves of the design are all skills that take time and practice to learn well. And, of course, these and more steps are accomplished in the constant context of the challenge of dealing with the hidden defects in the wood. Now the cutting edge of my technical skill level involves reading the grain of a piece of briar to get the maximum impact by bringing out the try beauty of the wood in the design I'm executing and creating shapes that are in good taste but that improve the comfort and feel of holding a pipe--the tactile aspects of style and design. When I fist started making pipes, Lucite captivated me (black and tortoise are my favorite colors). Tradition and Jim Margroum have overcome me, however, and I now much prefer vulcanite stems, which I find easier work with and lighter. Also, most of those who have shown an interest in my pipes seem to prefer vulcanite. I can either material, however, and if a smoker prefers Lucite, I can usually provide it in the conventional colors. Most of my pips are medium bowled--3/4 to 7/8 inches in diameter, with depth proportionally balanced to the particular style. My horns are the deeper, although I have made and do make horns with shallower bowls. My next most prevalent size is large-bowled pipes, which I execute in the hunter's pipes and the free styles, with bowl diameters of one inch and larger. Sometimes I will make smaller pipes in the hunter's and free styles if I have what promises to be a nice piece of smaller wood. I have had trouble finding good briar, and I'm working at going directly to the sources. I now have an Algerian connection, and I'm planning a trip to Corsica and Italy later this year. The curing of briar is an interesting subject. Much intrigue and secrecy are associated with it, and I also sense that it generates much misinformation. My research into the subject has been primarily by way of ferreting out Prior Art Patent References, and what I have found seems both obscure and contradictory. Combine this with a wide diversity of "expert" opinion and what are generally though to be the contributing functions of bowl width, wall thickness, tannin levels and moisture content in relation to break-in period and smoking coolness, and you seem to have a number of indeterminate variables. 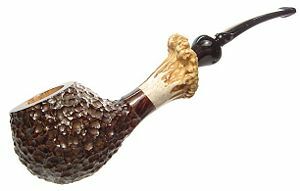 For now, I use well-seasoned briar and what are generally thought o be acceptable design parameters for pipe style and dimensions. It's not that I won't change my mind on the subject of curing briar, only that I haven't yet found a process or procedure that will produce a reliably consistent result. I am certainly open and open-minded on the subject and will welcome and test any suggestions. Is it strange to find a lawyer and a pipe maker coming together in the same person? Curious, perhaps, and there are certainly fewer jokes about pipe makers (are there any?). But I have found a certain commonality in reducing the intricacies of the law and of briar--each knotty and gnarly in its own way--to simplicity and grace. Have I succeeded? I'm still working on the pipes, although some of the praise I've received after less than three years of work is highly gratifying. As for the law, a Federal District Court judge once remarked to me, "Mr. Learned, you might not always be rihgt, but, by God, you are never uncertain." I think I shall continue to strive for this state in my pipe making as well. I do know that it is a contant delight to look at a block of rough briar and then at a finished pipe that came out of once similar to it and say, "I did that." And last, but far from least, I would be remiss by not mentioning Collen--my most ardent supporter and softest critic she has been a constant confidant and companion on this pipe-making path of mine. She has participated in all aspects of the journey, from selecting equipment to accompanying me on trips and to shows in Dallas, Richmond and Charlotte. Colleen knows as much about pipes as most of the people I have run into, she graces my presence with real class, and she puts up with haring all the bad things I can say about pieces of brair that have gone south on me. This page was last edited on 5 December 2015, at 10:40.